The earliest known Life fossils are 3.8 billion year old stromatolites, rocky structures composed of cyanobacteria and sand. From the previous post, “What is Life?” it is readily apparent that living things possess multiple levels of complexity. 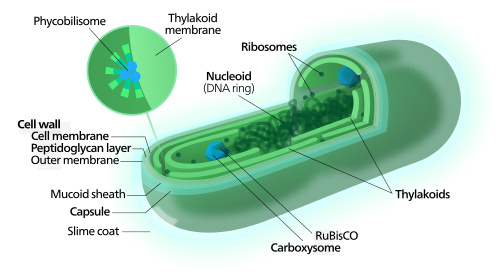 For even the simplest organism to survive, all of the components, whether they be physical structures or biochemicals, must perform their functions well and in concert. Living things must balance on a thin edge of interconnected complexity to survive. How is it possible to believe that all of this was built up piece-meal over millions of years, during which many of the components and functions were not fully in place, or to believe that small, stepwise changes in DNA over time result in new structures, when the incomplete sections of DNA must have existed long before there was a workable function? To believe that is not only improbable but insane! And it is not science. It is based on the progressive philosophy that the universe is naturally progressive and will naturally, without any directions, progress from simpler to more complex and from nonliving to living. When applied to the origin of life a new principle is proposed called the Life Principle. This theory assumes that the universe will naturally self-organize to produce life in any “suitable” environment over time. The scenarios for the first life are equally unbelievable except to the true philosophical believer. These scenarios cannot be called theories, but at best hypotheses and at worst wild speculations. Among the speculations about where and how life emerged from nonliving matter, the most popular are as follows. Interstellar Pre-assembly: Life self-assembled from amino acids, peptides (short sections of protein), and proteins that came to earth from space where they were assembled from stardust. Warm Soup: In the absence of life to consume them, biochemicals that spontaneously formed accumulated in shallow seas until there were enough to form the first primitive life. This is the warm soup Darwin spoke of. Panspermia: Life forms came to earth from space where they had existed for eons, thus extending the time period for their formation beyond the 4.5 billion years of earth’s existence. Geothermal Energy: Life formed at geothermal vents that provided the energy needed to build complex biochemicals and structures that then came to life. Deep Hot Biosphere: Life formed deep underground from hydrocarbons cooked by mantle heating to form more and more complex molecules that then came to life. Clay Template: Life formed from biochemicals on the surface of clay, which acted as a template for assembling biochemicals and structures that eventually came to life. Inorganic Life: Life first formed from inorganic particles such as clay, later adding organic chemicals for more efficient functions and finally rejecting or eliminating the original inorganic chemicals. RNA World: RNA formed first and “learned” to make proteins and other structures through self-catalysis, later replaced by catalysis by protein enzymes. Protein First: Proteins formed first that then assembled RNA and/or DNA and membranes. Polycyclic Aromatic Hydrocarbons, (PAH), assumed to be abundant in space and early earth, through reactions such as hydroxylation, oxygenation and hydroxylation, led to formation of more complex molecules such as amino acids, proteins and RNA. Whatever the means, it is hard to believe that all of the interlocking biochemical systems and cellular structures could have self-assembled over eons of time. The famous experiment that true believers point to as evidence of spontaneous creation of life is the Urey-Miller experiment. In it, a mixture of methane, ammonia and hydrogen, which were thought to compose the earth’s early atmosphere, were subjected to an electrical spark, simulating lightening. Over time, a few of the smallest amino acids, the basic building blocks of proteins, were formed in very low concentrations within a mixture. The truth about the experiment is that it formed a tar of numerous organic chemicals often referred to a “beilstein,” meaning a gross mixture. Beilstein is short for the largest and oldest database of organic chemicals that was first published in 1881 as Beilstein’s Handbook of Organic Chemistry. Its current electronic database can be found on line at Reaxys and contains many thousands of chemicals, thus the definition. The conditions of the experiment are now not thought to have existed on the early earth. HDTKT? They took an “educated” guess from proxy evidence. Additionally, oxygen would have prevented many of the reactions leading to amino acids and would have destroyed many other products. However, without oxygen in the atmosphere, there would have been no ozone layer to protect the products from the destructive effects of ultraviolet rays streaming from the sun. Reaction products that were formed by lightning in the atmosphere would not be favored or exist for long enough to accumulate under such conditions. Water will also prevent or retard these reactions, and it is destructive to many products. Interfering molecules and water would have to be eliminated to create even the simplest peptide, (a short section of a protein consisting of a few amino acids linked together by eliminating one molecule of water for each link). Excess water would result in peptide links falling apart to leave amino acids. The few amino acids in the experiment were formed as mixtures of right and left handed molecules, but only left handed amino acids are used by living things. Going from a mixture of amino acids in low concentrations in a tar containing many compounds to proteins or larger amino acids is not so evident, nor is it evident that it led to the creation of life. Forming a few amino acids in a tar in a highly controlled experiment does not point to an accidental, spontaneous creation of life or molecular evolution. If anything, it points to a designer, not the opposite. It is a leap of faith and thus not science. It is philosophy, opinion or religion, not science based on facts. The encouraging thing about origin of life studies is that there are still multiple schools of thought, which is a healthy situation in theoretical science. A lot of work is being done to try to determine the best solution to the problem, but the search is far from over. Even if we can discover A route from dead chemicals to living systems, we will never know if it is THE way it occurred. It is a one-time event that cannot be fully understood by science because Science is only concerned with predictable, repeatable and measurable aspects of the universe with which we can or could conceivably interact. Urey-Miller experiment or simply Miller experiment by Stanley L. Miller directed by Harold C. Urey in 1953. Previous Article What is Life?